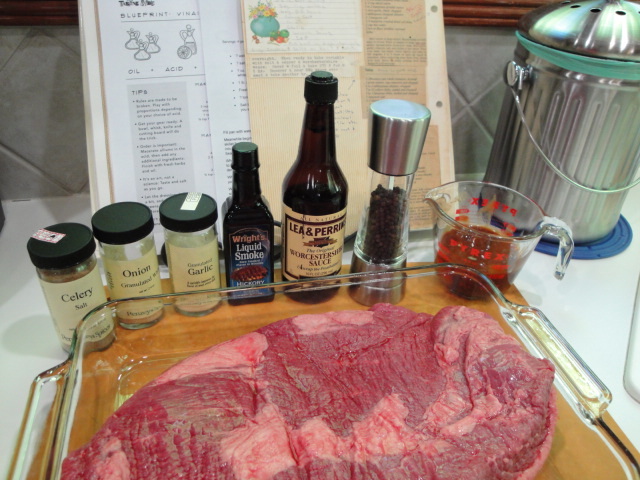 This BBQ Brisket recipe is a throw back to my graduate school days. While most of us didn’t do a lot of cooking while in graduate school, especially big hunks of meat like beef brisket-limited funds and time were a bit of an issue. 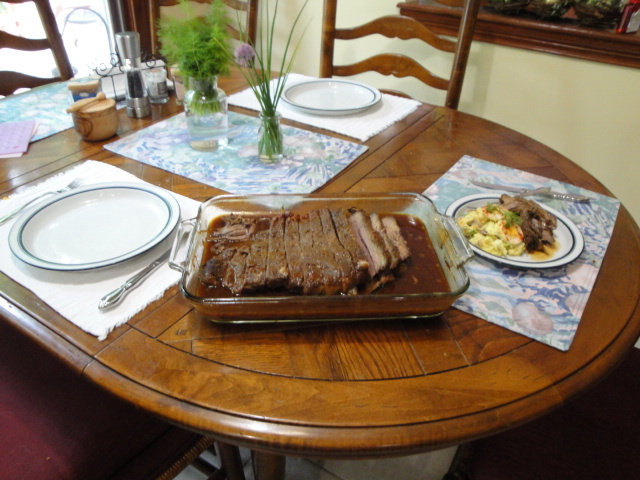 I was lucky enough however to be friends with a couple who invited me to dinner one evening and served this brisket. It was falling apart tender and loaded with flavor. Needless to say I’ve been making it ever since. The recipe in my files is rather cryptic with limited instruction and few quantities listed. It’s so simple and I’ve made it so many times over the years that I often don’t even bother to pull it out of the file. However, for this post I attempted to measure and record a bit more of the “technique”. I have to admit, however, that I’m not sure this was the best I’ve made (even though my husband declared it the best ever – it’s been a while since I’ve made it, so this could be the explanation for this). So whether you decide to measure or simply sprinkle and splash I don’t think you can go wrong. If you are a Smoked Brisket connoisseur you will likely be dismayed with the use of liquid smoke. But please don’t dis it until you’ve tried it. Liquid smoke is actually a natural product made by channeling smoke from smoldering wood chips through a condenser, which quickly cools the vapors, causing them to liquefy (just like the drops that form when you breathe on a piece of cold glass). The water-soluble flavor compounds in the smoke are trapped within this liquid, while the nonsoluble, carcinogenic tars and resins are removed by a series of filters, resulting in a clean, smoke-flavored liquid. (courtesy of Cook’s Illustrated Magazine September 2007). Look for one like Wright’s that is just water and liquid smoke concentrate. It’s an original that has been in production since 1895, when Ernest H. Wright a pharmacist in Kansas City, Missouri began bottling and selling the stuff. So hailing from Kansas City and having the blessing of Cook’s Illustrated gives it a bit of street cred, but best of all it allows you to have some great brisket with little effort and no equipment required beyond a large oven safe baking dish, some aluminum foil and an oven. One 5 lb. beef brisket, a few flavorings and some BBQ sauce and a couple of days are all that are between you and some delicious Smoked BBQ Brisket. 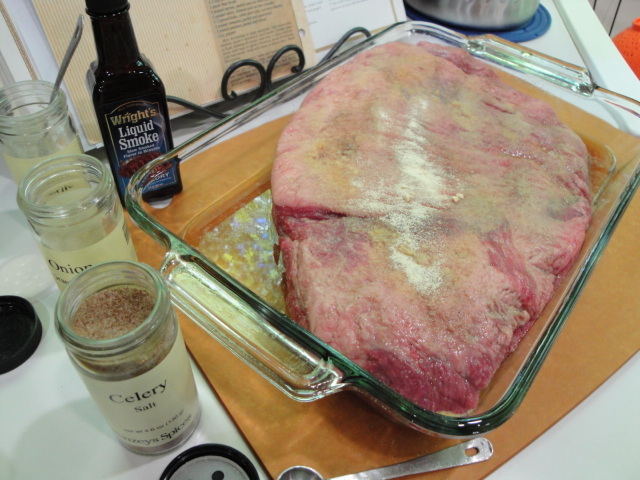 On day 1, sprinkle the brisket with celery salt, onion and garlic (powder or granulated) and douse it with liquid smoke. Cover it with plastic wrap and refrigerate overnight. 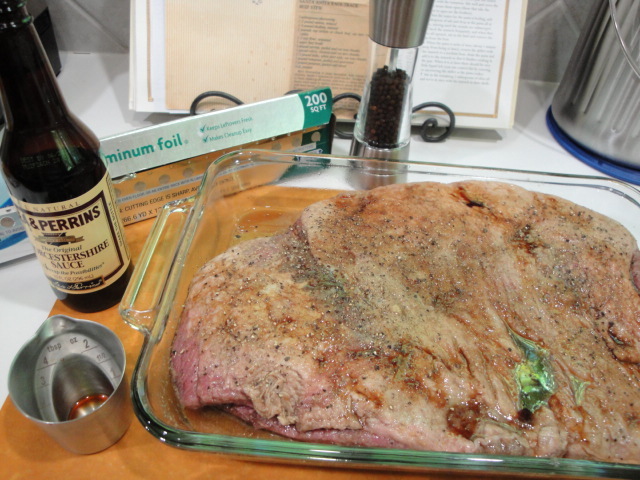 When your ready to cook it pre-heat your oven to 275°F, add the Worcestershire sauce and some freshly ground black pepper and cover tightly with foil. I start the cooking with the fat cap side down. Start a timer for 5 hours-low and slow is the key to cooking a cut of meat like brisket. Some time about half-way through the cooking process (your nose will generally give you an indicator) I flip the brisket over to put the fat cap on top. If you wait too long it will be more difficult to turn. I baste the top with some of the juices that have begun to collect in the baking dish, cover it tightly with the foil once again and back into the oven it goes. At the end of 5 hours it should be tender and look like this. Spread it with some BBQ sauce (I’ve tried many over the years and all work fine-I just avoid those with smoke flavor. You have plenty of it already). 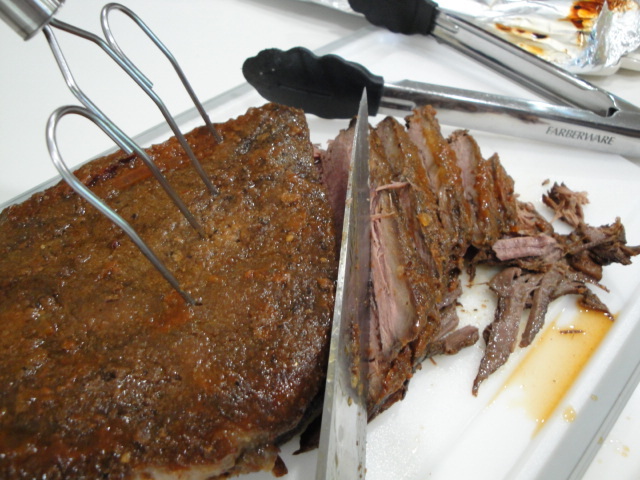 If the brisket seems very tender you can continue to bake it uncovered (you may need to add a bit of water) or if it seems to need a bit more tenderization (check this by poking and pulling a bit with a fork) recover tightly with the foil. Bake for 1 more hour. At this point it’s ready to eat, but there will be a generous layer of fat floating on top of all those great juices. If I’ve allowed enough time, I like to refrigerate it over night. It’s then very easy to lift off the solid fat. If not simply take a small ladle or large spoon and skim off as much of the fat as you can. If it’s refrigerated, I pop it back into a low oven (275° to 300°) oven to warm or if I’m in a hurry I pop it into the microwave. It’s much easier to slice when warm/hot. Slice it and pop it back into the dish with all of those lovely juices. If you want a thicker sauce you could put the drippings into a sauce pan and reduce them, but I like the thinner natural jus. And yes, all it needs of some of Aunt Mary’s (Grandma Alice’s) Potato salad on the side. It also make a great sandwich with the addition of a slice or two of dill pickle. 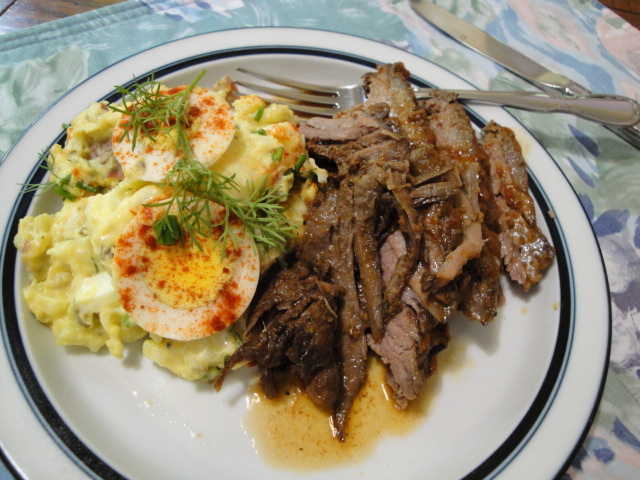 Servings: 10 at least- and the leftovers are great, but you can make a smaller brisket by buying a smaller brisket. 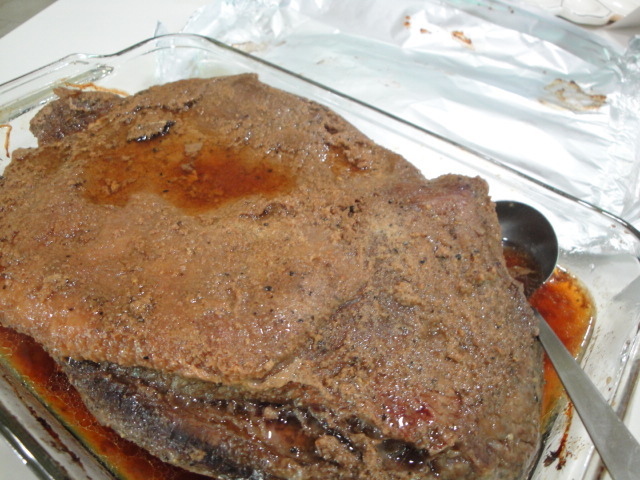 Place brisket in a large glass baking dish. You can usually fit a 5+ lb. brisket in a 9 x 13 inch pan. Sprinkle both sides with liquid smoke, celery salt and powders. I put the fatty side up. Cover with plastic wrap and refrigerate overnight. 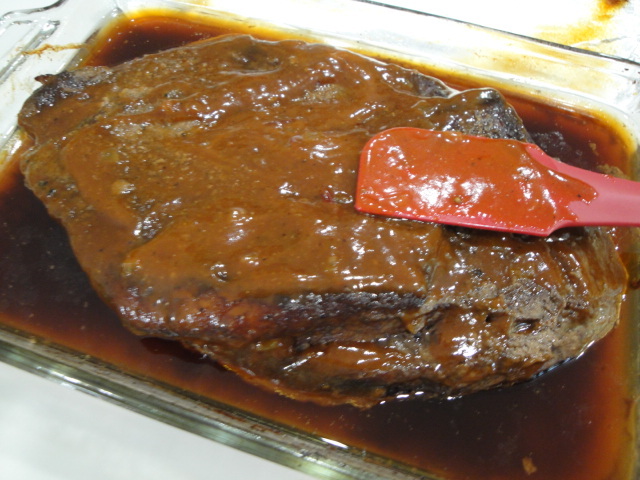 Remove brisket from the refrigerator and heat oven to 275°F. Sprinkle with pepper and Worcestershire sauce. 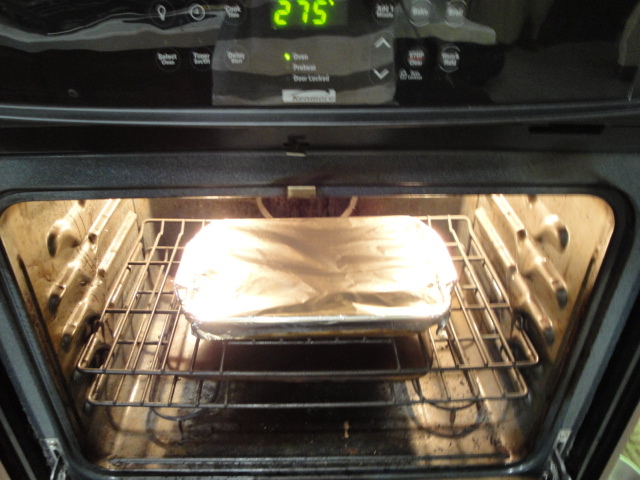 Cover tightly with foil and bake for 5 hours. I generally start it with the fatty side down and turn after 2 ½ hours or so. At this point it will still be firm enough to turn easily. 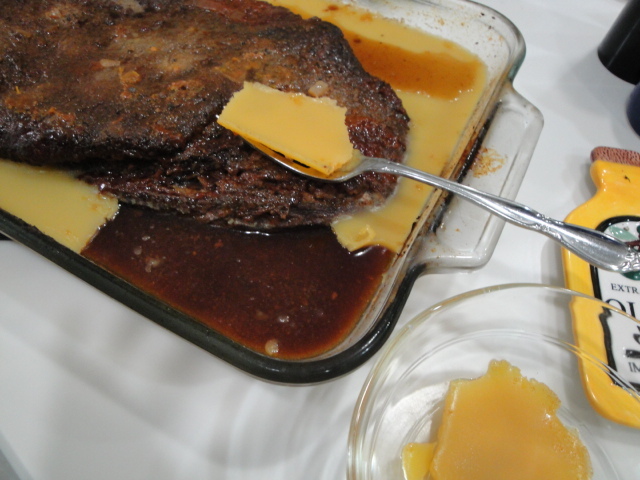 Uncover and pour BBQ sauce over the meat and bake another hour or until the meat is very tender. If leaving uncovered you may need to add up to 1 cup of water. If I’ve allowed enough time, I refrigerate overnight so I can easily remove the excess fat. If you want to eat it on the day of baking you can skim much of the excess fat from the broth with a large spoon or small ladle. * the original recipe had no measurements for these and until I was preparing for this post I never measured, just sprinkled liberally and it was great each and every time. In fact I think it was perhaps even better! So give it a try.